I type a fair amount and decided that I should learn to touch type properly. I decided that if I was going to learn to type properly then it was also a good opportunity to switch to a more efficient keyboard layout and so I decided after some deliberation to try Colemak. I used one of the free typing tutors on linux and after some practise sessions found it painful for my hands. I worried that if I continued typing 'properly' in this way there was a good chance I might get RSI. So I did some investigation into ergonomic keyboards and ended up building and programming a dactyl keyboard. This new keyboard was much more comfortable to use. I used gateron brown switches which give good tactile feedback and are not too noisy. I continued practising colemak and built a second ergonomic keyboard in the same style for the workplace. It has now been almost 6 months since I started learning Colemak and made my keyboards. My typing speed is only around 50 wpm at the moment and about 97% accurate. However typing is comfortable and I am typing faster and more accurately than I did with the qwerty layout and the old standard keyboards. I continue to practise regularly on typeracer and 10fastfingers and am steadily improving. While this is quite a bit slower than some of the speedy typists on this forum it would be a happy milestone for me. I am already more efficient than I was before starting the whole process and typing is a much more pleasant experience. I do not foresee myself ever changing back to qwerty or standard keyboards and the initial struggle was definitely worth the reward. Grats on your choices and thanks for the writeup. would i be right in thinking you need a degree in electronic engineering to build that? i imagine you can't get one ready built too easily? Actually it is not all that difficult to build the keyboard but it is a lot of work. You can make it in 4 days if you have the parts, and some soldering and programming experience. I made a terrible video that explains the whole process with links to all the resources you need. I don't know of anybody selling them, but I think the closest commercial version would be the kinesis advantage 2. This one also looks snazzy - I'm not sure I'm up to building one though? You have to 3D print the bases right? Then get someone to make you a flexible PCB? Its pretty extreme end of the hobby market? I'm not sure I could buy a kinesis after seeing how cool this one looks.. This one also looks snazzy - I'm not sure I'm up to building one though? You have to 3D print the bases right? Then get someone to make you a flexible PCB? Its pretty extreme end of the hobby market? Well, its designer recommends a flexible PCB and makes his himself, though that can be a very frustrating process. Hand-wiring is also an option, but is bulkier. There is very little room to work compared to most hand-wiring projects. My hand-wired keyboard was pretty forgiving in this respect, but it still wasn't the smoothest process. If you print the frame in pla and order your parts from aliexpress or similar you can make the keyboard for under USD150, (if you don't factor the cost of your time), which is a lot cheaper than an ergodox or a kinesis. It was actually the first keyboard that I made (although I have made 3 of them now), so if you are motivated and have some soldering experience I would still say go for it. Although there are no guarantees that you will get it to work, all 3 of mine worked without too much hair pulling so it's certainly possible. Well, I'm very glad to be wrong about the PLA printing cost! Last I saw it was like $300 all by itself. It is almost a year since my initial post. I enjoy reading about other people's progress with Colemak, so here is my update. Speed : I have put in some effort and the reward is an increase in the ease and speed of typing. 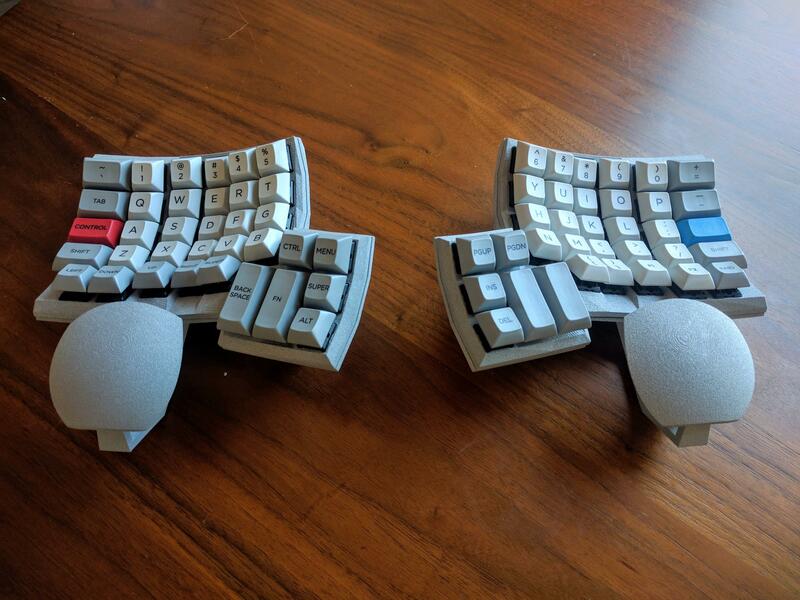 Keyboard(s) : I continue to use my dactyl keyboards and am very happy with them. 2 continue to work reliably but 1 has developed an intermittent fault and occasionally needs to be unplugged and plugged back in again. 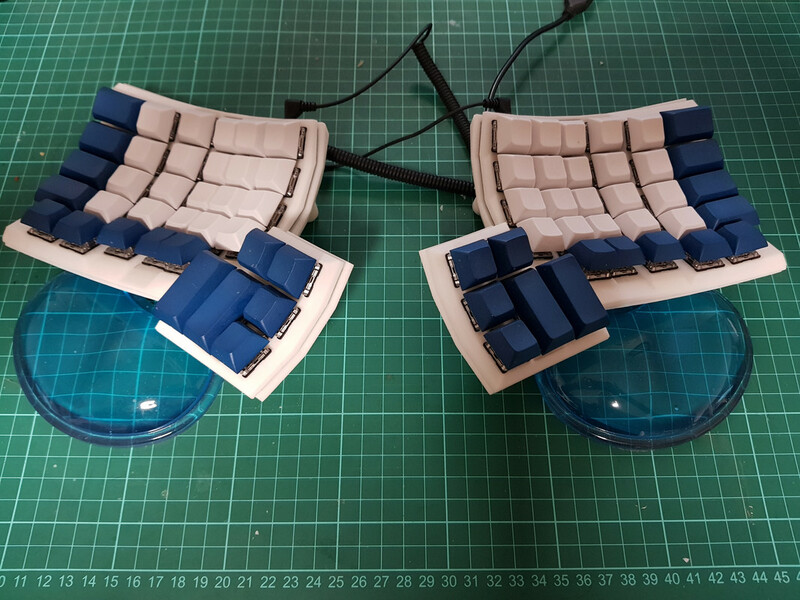 I also assembled an atreus keyboard for when I need a portable keyboard - while it is not as comfortable as my dactyl, I can give it a thumbs up. Good quality and reasonably priced, (I have no affiliation with atreus). Future Goals : None. I have achieved my keyboard / typing goals - reasonable typing speed and comfort. I expect to maintain my current speed without much effort, but I don't expect to get very much faster. There may be a slight increase from year to year in the future, but I won't be putting time and effort in this direction. Promoting Colemak : It would be good to see more people using the Colemak layout and ergonomic keyboards. I try to help spread the word as my keyboard tends to invite questions, but most people are not interested in alternative layouts (at least until they get RSI). Maybe more people would be interested in Extend once they hear about it? It's easier to learn than Colemak and gives a huge benefit. So in terms of cost-benefit it actually beats Colemak by a wide margin in my opinion. I think that any kind of beneficial keyboard mod can be a "gateway drug" to Colemak. ;-) This includes your wonderful keyboard, of course.